The Pure One Flow is the epitome of the 'kitchen radio' - it certainly feels the part, but does it deserve a place in your home? The Pure One Flow internet radio is essentially Pure's entry-level offering when it comes to internet radios, sitting below the Pure Avanti Flow in the brand's internet radio range. With a sub-£100 price tag it's also one of the most affordable 'smart radios' that you can buy today. Offering up Wi-fi connectivity as well as access to Pure's own Lounge and Pure Music service, you're treated to a veritable feast of interactive features. Of course the question is, does it all work? As with pretty much every Pure product ever made, the build quality is superb. The thick matte black shell conveys two things instantly; firstly that it's well designed, and secondly that you can place it in a kitchen without panicking every time you spill your cup of tea. The buttons on the front are simply laid out with five contextual buttons under the screen and two dials for quick selection and volume control and the power button is located on the side. 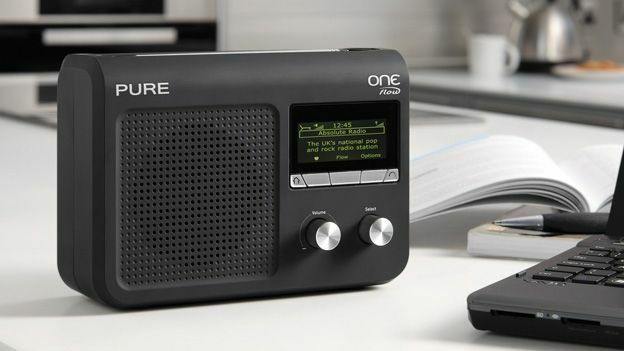 The Pure One Flow is first and foremost a traditional DAB digital radio and in this regard it performs admirably, setting up the device via the backlight LCD screen is simplicity itself while scrolling through stations is easily done through the selection dial. Included right out of the box is access to Pure's internet radio hub known as The Lounge. Once the device is connected to your Wi-Fi (a fiddly but worthwhile process) you can then access services such as Listen Again, Internet Radio as well as tagging songs in real time. Listen Again suffers ironically from having too much content on it making selection with the dial a slow process, that said once playing it works extremely well. Internet Radio offers you a mightily impressive catalogue while the quality of the stream is superb, even with the 1.5Mbps connection we had. Tagging works across all of these services, so whether you're using DAB or Listen Again it's simply a matter of pressing the Tag button and being given the option to download the song or save it as a tag to download later via your computer. Offered alongside the One Flow and alongside any Pure product that's compatible is the Pure Music subscription service. For £4.99 per month you're given access to an internet based music library which is accessible either through your web browser, Pure Music app or through a compatible Pure Music radio. From spending a few weeks with the service we found that despite costing £4.99 per month there were still a number of albums that were not available to stream for free. That said, these were in the minority and there was a large and varied amount of content that could then be easily added to playlists and then chosen via the One Flow Radio once it had been registered. The One Flow has a surprisingly powerful speaker and works admirably even outside. While it won't be recreating the barbican anytime soon, it's 2.5W speaker is still able to define both high and low ranges pretty effectively and as a product for the living room or bedroom it's more than capable of filling a room. The Pure One Flow is a rare thing in that you take it out of the box, plug it in, and it just works. The fact Pure has managed to keep this simplicity intact while adding such a huge range of features is truly impressive. Pure Music works well on the One Flow with our playlists being synced perfectly. That said, we wonder how effective it will be with services such as Spotify already so cemented. The Lounge features are a genuinely useful addition with Internet Radio, Tagging and a Favourites folder making it easier to sift through the content. Although the Pure Music service isn't yet perfect, it's hard to think of a product that offers more value, and more quality for this price range.